MX Player allows you to play video files in almost any format. Thanks to a number of codecs available for download in the Play Store, it supports all phones and tablets. It is the first player to support multi-core decoding and hardware acceleration to deliver the best performance and experience. Additionally, MX Player allows you to load various kinds of subtitles, pinch the screen to zoom the picture in, and control playback with swipes. 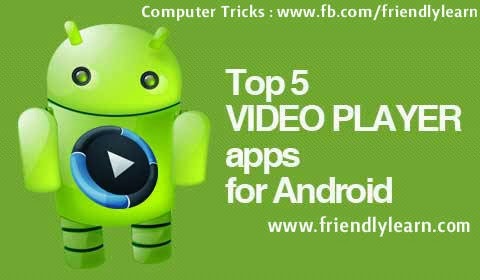 VPlayer is an application that can play MKV, FLV, MOV, and AVI files flawlessly. It is compatible with most devices available on the market and offers subtitle and codec support as well as streaming over the network. The app can play both files stored in the device memory and on the Internet, for example on YouTube. Thanks to hardware-based decoding, VPlayer uses less battery and doesn’t impact the performance. If you’re a Windows user, you probably know the VLC Player. It is one of the most popular apps on the platform, which was ported to Android a few months ago. VLC plays most local and audio files as well as network streaming. It has a built-in media library that allows you to browse folders directly. There’s also support for multi-track audio and subtitles and a handy widget. While playback is controlled with on-screen buttons, volume and brightness can be changed with gestures. VLC for Android is currently at the beta stage, so it may contain a number of bugs. If you’re afraid of performance drops or the player doesn’t work on your device at all, try another app. However, don’t forget about VLC. It is promised to get new features, interface and stability improvements soon. Wondershare Player sports a good-looking interface, but it is just an addition to its rich functionality. The app can play files stored locally, but it is obvious that it was built for online streaming. Developers equipped it with built-in library of various streaming services. YouTube, ESPN, and Vimeo are just to name a few. You can search for keywords, browse categories or paste a link to a video from another source. Generally speaking, Windershare Player is a great app for video discovery. This application is shipped with Archos tablets and portable media players, but thanks to manufacturer’s generosity, it’s available to everyone for download. Archos Video Player is one of the best-looking video apps on the platform and sports a surprisingly polished interface. To make the most of your multimedia library and highlight your favourite titles, AVP automatically downloads high-quality posters and information. It supports all common video formats as well as multiple network protocols. It can import files from external locations, such as SMB- and UnPnP-enabled servers. Thanks to keyboard and remote compatibility, AVP is the perfect TV companion. It can be installed on a cheap Android stick and replace a traditional cable box.